I am Tony Santiago Owner of Precision HVAC. I hold a Master HVAC license and have 17 years of direct field experience in HVAC sales, service, design and installation. From owning a business to working for and with others in this industry overcoming many difficult situations I have acquired the necessary skills from real life experiences to build a strong business. I truly understand what good business is. I believe in doing things the right way from planning and preparation to execution and enjoy what I do. This field is constantly evolving and we evolve with it to stay on top. I expect nothing but the best in the people I employ. At Precision HVAC, We are a locally owned and operated heating and air conditioning company proudly serving both commercial and residential clients in the surrounding area. Our professionals have the knowledge, skill, and experience necessary to care for your heating and air conditioning systems at all stages of their service lives. We are adept at installing, repairing, maintaining, and replacing furnaces, boilers, heat pumps, radiant floor heating, and air conditioners. We also provide a wide range of indoor air quality services. Our professionals understand how important your HVAC system is to your family, your home, and your business. As such, we are honored by the trust that each of our customers shows in us. In every service that we provide, our professionals place client satisfaction as our highest priority. When you hire us for your heating and air conditioning needs, we will bring this dedication to excellence to task for you. 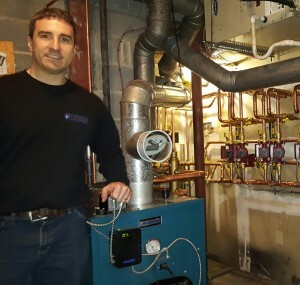 Call Precision HVAC today if you need to hire a professionally licensed heating and air conditioning contractor in Saugerties. Our polite and knowledgeable staff would be happy to take your call, to answer any questions that you may have, and to schedule your appointment today.